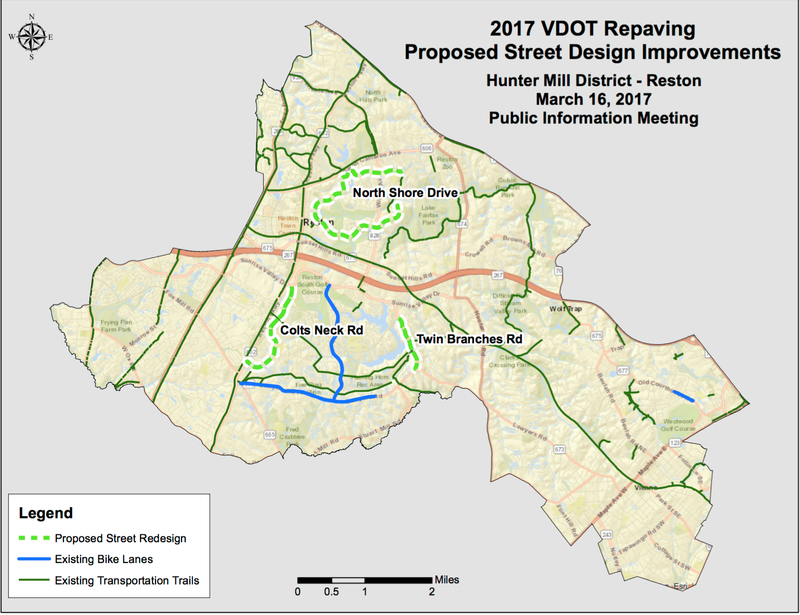 Cyclists are needed to contact the county bike program by March 31 to support new bike projects in Reston. At a meeting last night several local residents spoke out strongly against proposed bike lanes on Colts Neck Road and North Shore Drive. There were minor concerns about the project on Twin Branches Road. 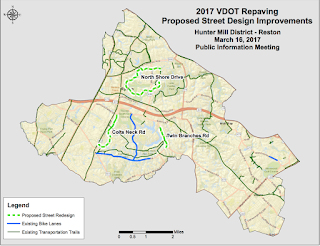 When the Lawyers Road and Soapstone Drive road diet projects were proposed, the same arguments were used against those roads. On Lawyers Road there was almost no impact on traffic throughput while at the same time crashes were deducted by over 60% during the 5 years since project completion. The most vocal opposition was against the road diet project on Colts Neck Road. During repaving of the road this summer Fairfax Co is proposing to reduce the regular travel lanes from two in each direction to one lane in each direction with bike lanes. Current traffic volume is well below the recommended level for implementing a road diet and less than the volume on the successful Lawyers Road project. The Colts Neck project will provide dedicated bike facilities and a safer road for everyone, including the many pedestrians in that area who regularly cross to access the shopping center on the east side. I strongly support the bike projects on Colts Neck Road, North Shore Drive, and Twin Branches Road will make those roads safer for all users while providing much needed bike facilities. The road diet on Colts Neck Road, where many cyclists currently ride, is especially important. Byclists will have dedicated space on Colts Neck and pedestrians crossing the road will be safer, having to only cross one lane in each direction rather than two. Speeds should be reduced as well. When the Reston Town Center Metro station opens, Colts Neck will be a major bike route to that station. The bike lanes on Colts Neck will connect to the planned cycletrack on Sunrise Valley Dr. and connect to the many developments planned along Sunrise Valley Dr.